My kids LOVE Nutella. I swear they could eat it on anything, or straight from the jar. Actually I have caught them eating it straight from the jar. Since, Nutella is so loved by the little kids and big kids a like, I decided to come up with a recipe using Nutella. What could be better than a Nutella Cookie Recipe? That is how Nutella Chocolate Chip Sugar Cookie Bars were created. 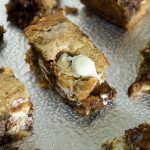 These cookie bars take the delicious taste of Nutella, paired with chocolate chips and sugar cookies. 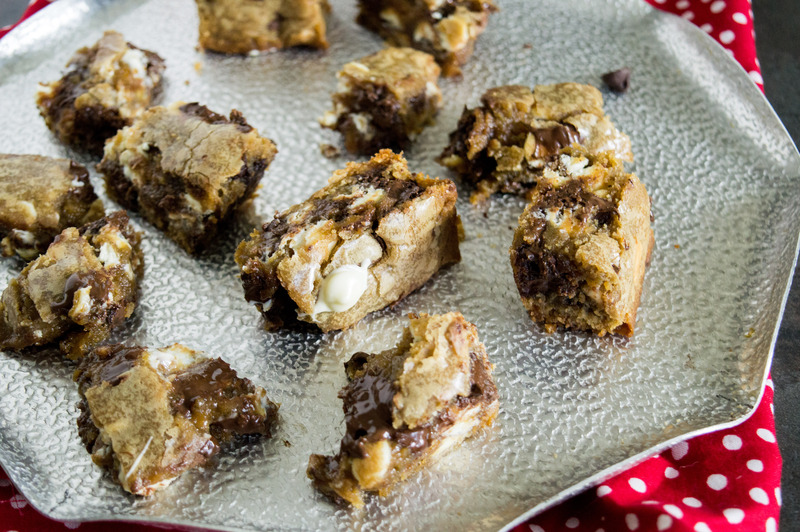 I don’t think anyone can resit these amazing cookie bars. The only problem, you will want to make a double batch, because if your family is like mine this Nutella Cookie recipe will be gone before you have time to get a second one. In a large bowl cream butter, sugar, vanilla and eggs until fluffy, about 4 minutes. Set aside. 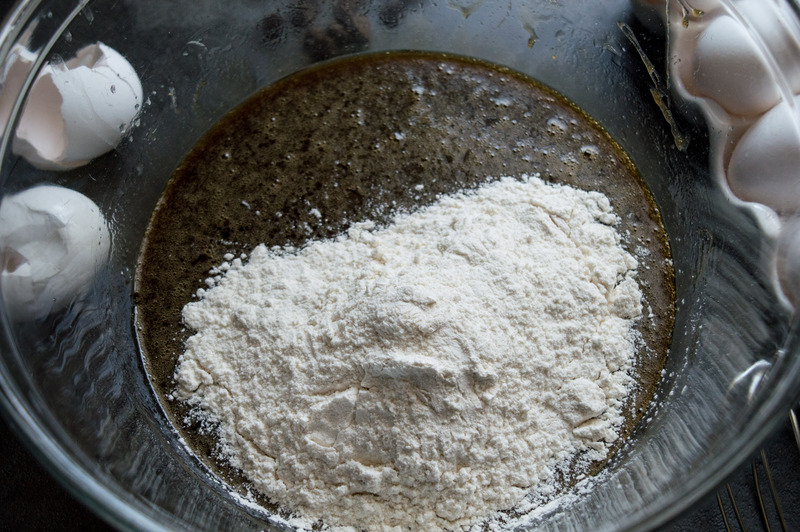 In a smaller bowl, mix flour, baking soda, and salt. 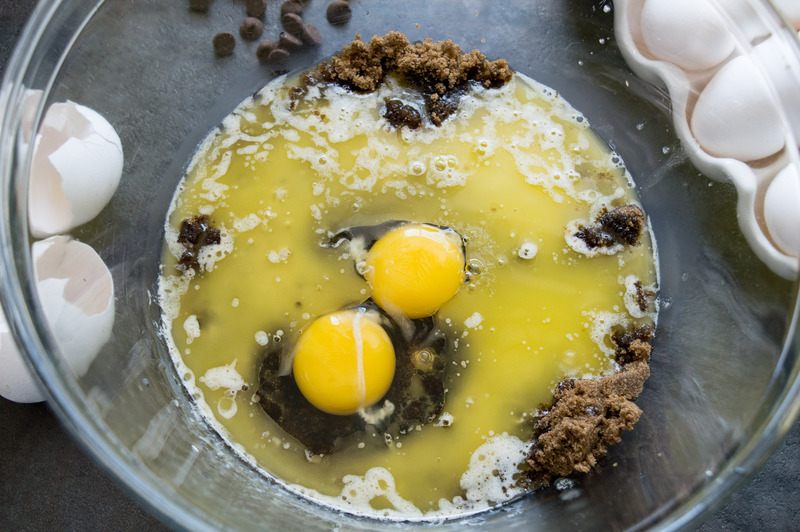 Set aside about 3 tablespoons of the mixture. 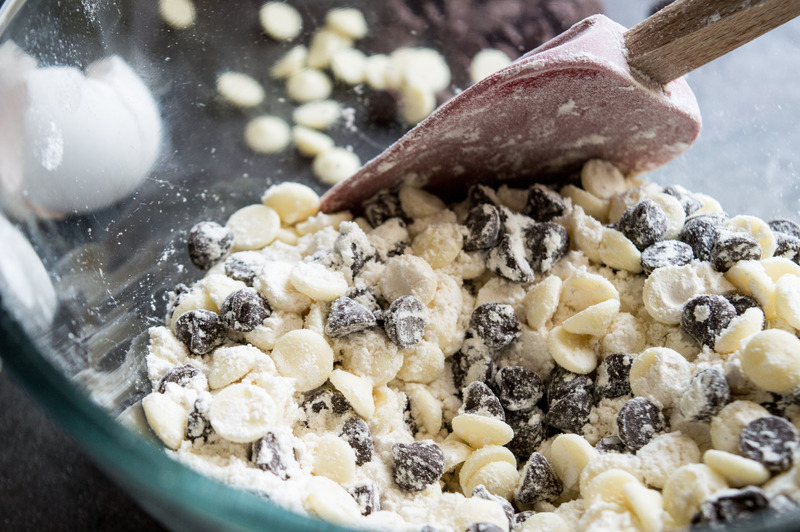 Mix the leftover flour mixture with the chocolate chips. 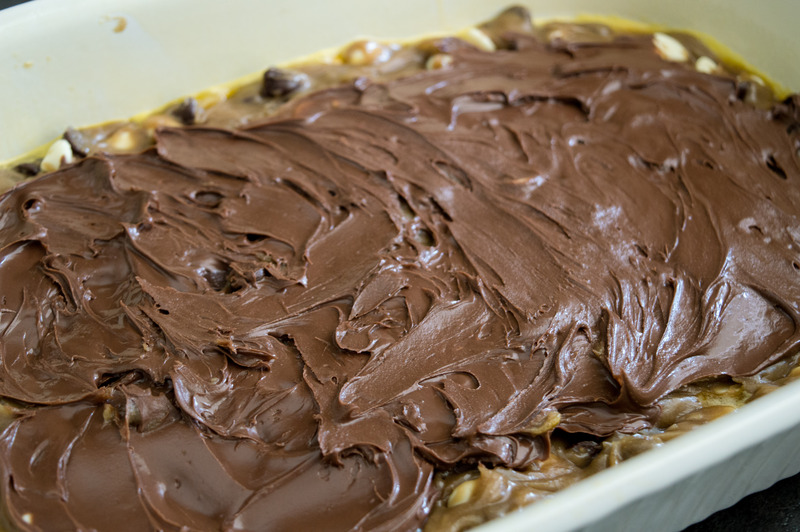 In a well greased 11×7 pan, add half of the cookie dough mixture, spread it over the pan for an even layer. Dollop in round spoonfuls of Nutella evenly over the cookie dough. 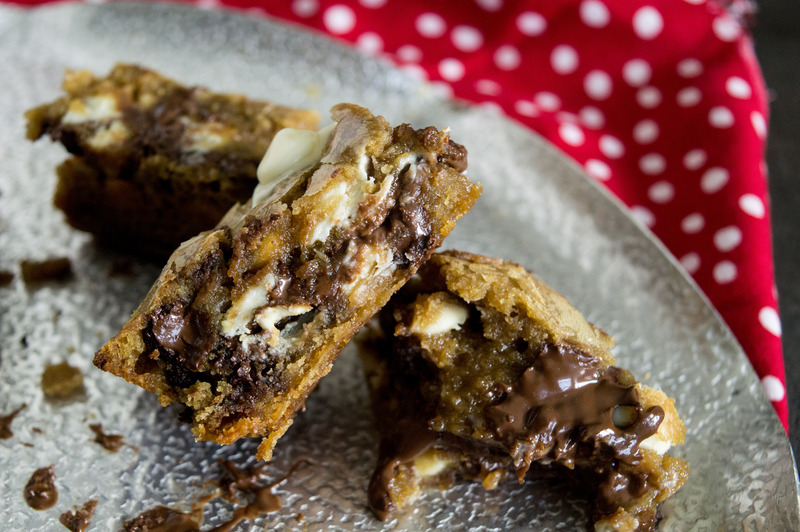 With the back of a spoon, gently spread Nutella to create an even layer over the cookie dough. Top with the remaining cookie dough mixture. Spread to create an even layer. Bake for 30-35 minutes, or until the cookie dough is a nice golden brown and a toothpick inserted in the center comes out clean. Remove from the oven and let cool before cutting and serving. Preheat oven to 350 degrees Fahrenheit.Looking for a Nutella cookie recipe? In a well greased 11x7 pan, add half of the cookie dough mixture, spread it over the pan for an even layer. Dollop in round spoonfuls of Nutella evenly over the cookie dough. 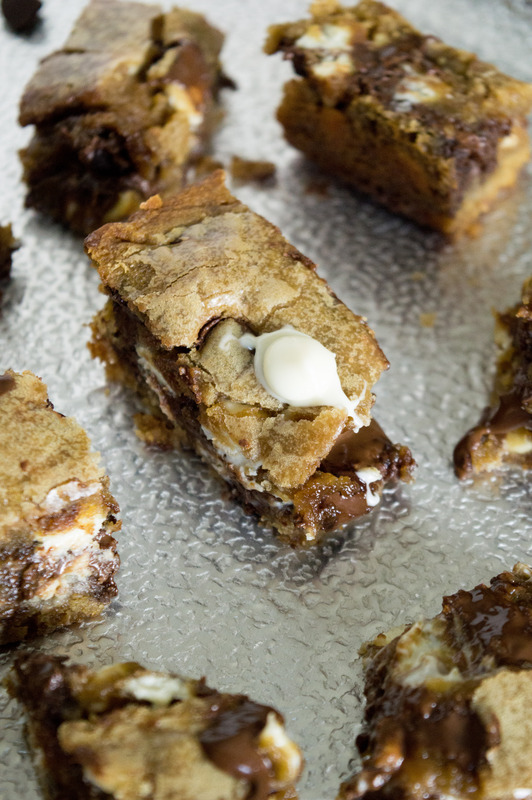 With the back of a spoon, gently spread Nutella to create an even layer over the cookie dough.